Out of utter desperation in search for The Balm's Bahama Mama Bronzer, I ended up buying this Matte bronzer at Digital Traincase because the latter was not and is still not available at any beauty bar counters. I think I bought this for only 330-350 pesos (preorder). From the time I learned the wonders of contouring, I was always in the look out for the best matte bronzer out there sans the reddish tones. I bought this due to its very affordable price and based on a US blogger review. I really wanted a matte brown color without a slightest hint of shimmer to achieve that model-esque cheek bones. There are 5 shades of this product and I chose Deep which is a deep cool brown. I love the packaging of this bronzer. Surprisingly, the glossy black compact looks very posh with a high end touch. The huge mirror is a major plus. The compact is almost as huge as my palm. Whoa!!! That's a lot of product don't you think? Deep has a neutral tones to it and does not appear orangey on me. It looks natural on my medium yellow skin tone without looking muddy at all. This bronzer has a soft texture. It glides smoothly when applied. A light hand is very much needed because of its high pigmentation. Despite its intense color, the product does not create patches on my cheeks once applied nor did it cake. The color is buildable too. I observed that this bronzer tends to be a bit powdery which I do not mind at all. It does not last that long even on my dry skin, the maximum would be 3-4 hours without primer underneath. There is a need to retouch through out the day. Sadly, this is not available locally but online shops offer a great deal on this bronzer. I really think that this bronzer looks very photogenic and naturally creates depths and shadows on my face. How do I apply this bronzer? I apply it with my Virginia Olsen Sculpting Brush in a "3" shape on the sides of my face and underneath my unnoticeable cheek bones. 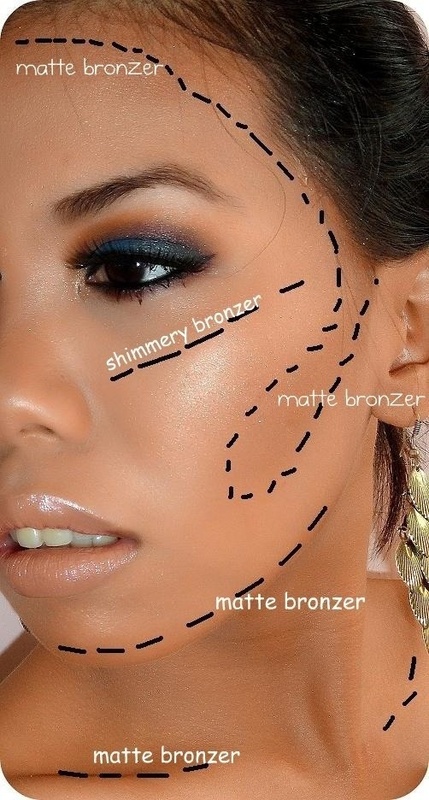 I also apply underneath my chin area to achieve that oval shaped face. This is how the bronzer looks like on me. I only applied it on the right side of my face and at the upper portion of my nose bridge between my brows. The color looks natural on me eh? For contouring, I used my ELF bronzer in the ELF blush/bronzer Duo. If you are looking for an affordable matte bronzer, NYX Matte Bronzer is truly worth a try. Will I buy again? No. I am now saving for a Benefit Hoola or my long time lemming (The Balm's Bahama Mama). Ang fresh naman ng red lip / bold brows look mo! Prominent and brows and red lips like it! Bakit po mkha kang katulong? hehe Ganon talaga kasi I AM A SERVANT OF GOD AND A SERVANT OF JUSTICE.. :)) Bongga lang diba? To the "anonymous" who's anonymous, as I was saying, first look in the mirror, ask yourself " do I like and LoVE who's looking back at me?" do me a favor and choose your battles. Do yourself a favor, not here. Don't go there... U will feel worst than before not better. to miss anonymous: bakit po di ka ugaling tao? BTW, great post Ms. Donnarence, helped me a lot thanks for sharing! do you know how this compares to the Nyx Powder Blush in Taupe? i have it kasi and it's not that pigmented.. it doesn't show up when i'm using it for contouring... gusto ko pa na man sana mag-practice galore sa pag-contour.. It looks great on u!!! Would u recommend Deep for fair-skinned people?